With its lush tropical landscape, cascading waterfalls, and near-perfect weather (temps average 76-80 degrees year round), Ninole is one of the best-kept secrets of the Hamakua Coast. According to the latest census data, Ninole is home to 210 residents in 91 households and the median age is 52. Located just north of Hakalau and south of Papa‘aloa along scenic Mamalahoa Highway, Ninole is a residential community with homes spread out along the coastline. An unincorporated town, Ninole does have its own zip code and boasts one of the smallest (and cutest) post offices in the country. 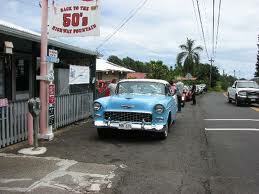 Along the Hamakua coast, the 50s diner is a great place to grab a burger and a milkshake. With its relaxed lifestyle and serene surroundings, Ninole has become an ideal place to retire and many appreciate the variety of outdoor recreational activities available. Waikaumalo Park, located next to Waikaumalo Stream in Ninole, is a popular place for cookouts and family get-togethers with its large covered dining area complete with picnic tables, expansive green lawn, restroom facilities, and ample parking. If camping, fishing, and diving are more your style, you can do all three at nearby Laupahoehoe Point, which also offers breathtaking ocean scenery. 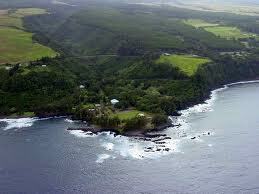 Laupahoehoe is also home to a community swimming pool, which is open daily and free to use. Families looking to move to Ninole will appreciate the area’s premium educational opportunities, including Laupahoehoe School, which recently became a charter school, and Hawaii Preparatory Academy, a private boarding school in Waimea. Give me a call today if you’d like to learn more about real estate opportunities in Ninole!